Black Canyon Ranch RV Resort is an exceptional place to live and a dynamic place to visit. 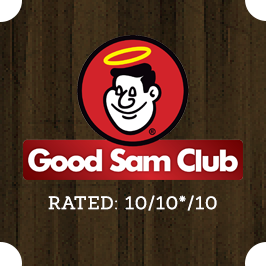 We are honored to announce our Good Sam Rating of 10/10*/10, for overall excellence in park aesthetics, well maintained grounds, cleanliness in buildings, pool area and restrooms, staff availability and friendliness. Only a mile from either exit 242 or 244 off I-17, 25 miles north of Phoenix, Black Canyon City is a quaint Arizona mining town. “The Ranch” is far enough from 1-17 to be traffic noise free but close enough for a quick trip to Phoenix or Flagstaff. Residents (long-term and short-term) are welcome to organize card games, billiards, horseshoe games and tournaments, swimming pool activities (such as water aerobics) as well as crafts and hobbies etc. Everything You Need in a Beautiful Setting! With over 11 acres of property to explore, you’ll never get bored at Black Canyon Ranch. Our amazing amenities include a year round pool and spa, nature walk and dog park, community garden, on-site coffee and eatery, game room, cozy fire pits to enjoy the stunning sunrises and sunsets, and more!